Pan American World Airways (Pan Am) was founded on October 27, 1927 as America's first international airline. The small company began flying air mail between Key West, Florida and Havana, Cuba. 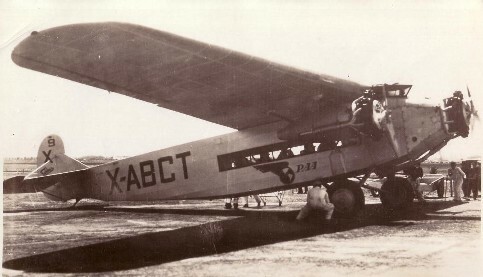 Pan Am would grow to serve most major Latin American cities by the early 1930s. To the left is one of Pan Am's early Foker F-7 aircraft. In 1935 Pan Am would begin Trans-Pacific service to Manila in the Philippines via Hawaii, Midway Island, Wake Island and Guam. Soon thereafter the Manila service would be extended onto Macau and then Hong Kong. The Pacific service was inaugurated with the famous Martin 130 "China Clipper" flying boat which is seen on the right. 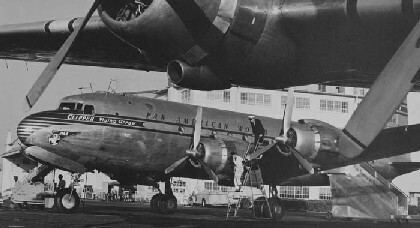 In 1939 Pan Am would initiate Trans Atlantic service with the Boeing 314 "Yankee Clipper" (seen on the left) Two different routes were operated depending on the season. The northern route included stops in Newfoundland & Ireland en route to South Hampton, England. The southern route operated via Bermuda & the Azores en route to Lisbon, Portugal & Marseille, France. These routes would be curtailed and eliminated as hostilities spread throughout Europe with the outbreak of World War II. At the out break of the war Pan Am had more experience with long distance flying than the US Air Force and was able to offer unparalleled assistance to the United States in building airports around the globe, training pilots, navigators and radio operators, ferrying supplies & aircraft as well as flying special critical missions. Pan Am's most famous flight of World War II was carrying President Roosevelt to Africa to meet with Stalin & Churchill. 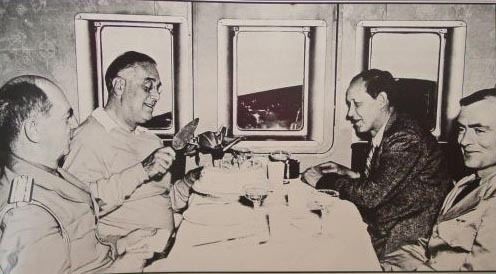 The President flew on his birthday and is seen on the right enjoying birthday cake aboard a Pan Am B314 Clipper. 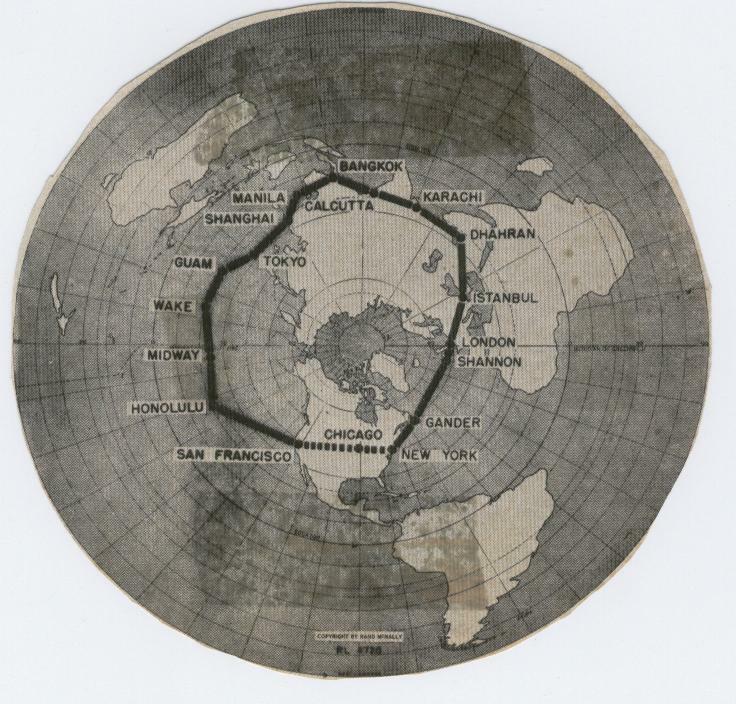 After peace was declared in 1945 Pan Am looked to re-establish its pre-war route network - which had been exclusively international. 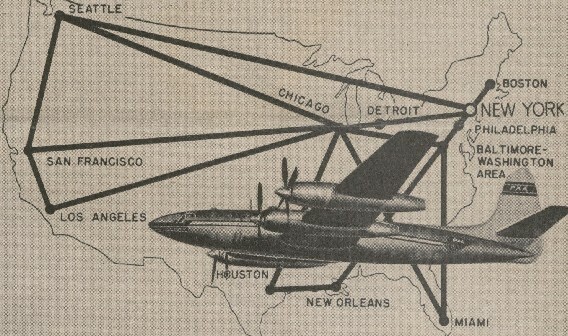 Additionally, Pan Am wanted to add some key domestic "trunk" routes such as; New York-Miami & New York-Chicago-Los Angeles/San Francisco (proposed domestic route map on the left - click to enlarge). These route requests came at the same time that America's domestic airlines were given access to many of Pan Am's international routes; TWA was authorized to fly to Europe. Northwest Airlines was authorized to fly to Asia. United was authorized to fly to Hawaii and both Eastern & American were given access to Mexico & the Caribbean. Sadly, Pan Am was denied access to domestic routes until 1977 when the airline industry was deregulated. There are some who believe that by then it was too late for Pan Am to ever establish a strong domestic network and that the lack of domestic routes more than any other factor is what caused the demise of Pan Am. 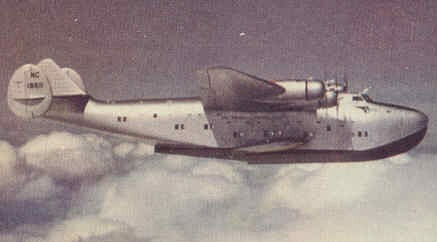 In the post WWII environment Pan Am did re-establish much of its international route structure and traded its flying boats for smaller faster & safer land planes. In the late 1940s Pan Am's fleet was composed of Douglas DC3s, DC4s and Lockheed 049 & 749 "Constellations." An example of the DC4 can be seen on the right. In 1947 Pan Am launched "Round the World" service with a Constellation departing New York and flying to San Francisco via points in Europe, The Middle East, India & Asia. The route of the first flight is shown on the right. In 1949 Pan Am introduced the world to the Boeing 377, "Stratocruiser." 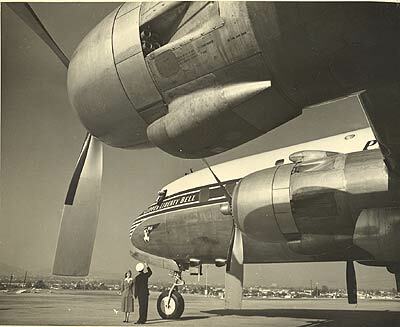 This double deck piston aircraft offered sleeper seats & berths as well as a lower level lounge. The Stratocruiser was the height of 1950s flying luxury and would reign as queen of the skies until 1958 when Boeing 707 jet service was inaugurated. To the right is Clipper Fleetwing, (N1037PA), on the ramp at Frankfurt airport. You can see the lower deck lounge windows of the Stratocruiser behind the wing. Below on the left is a Pan Am ad from 1949 showing an artist's rendition of the famous lower deck lounge and a cut-a-way drawing of the Stratocruiser. 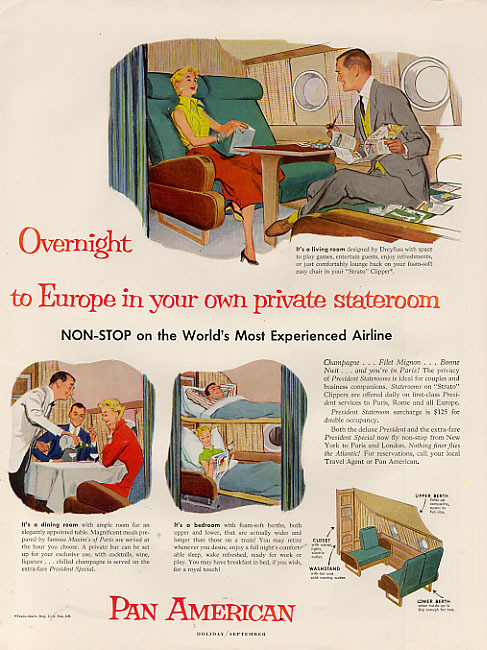 On the right an ad from 1954 with the super deluxe amenities offered in the forward stateroom of the Stratocruiser. Additionally, in the 1950s Pan Am would add both Douglass DC6s & DC7s to the fleet. These highly economical aircraft allowed Pan Am in 1952 to be the first international airline to petition for and inaugurate "tourist" (economy class) service on many international routes while continuing to expand it list of international destinations. To the right a Pan Am pilot & flight attendant stand at the nose of Clipper Liberty Bell, (N6519C) a DC 6 aircraft. On October 26, 1958 Pan Am was the first US airline to begin jet service with the Boeing 707 from New York to Paris. Pan Am soon added the Douglass DC8 to the fleet and later in the 1960s would add both the Boeing 720 and Boeing 727-100. To the left a Pan Am 707 in-flight. On January 10, 1970 Pan Am was the first airline to introduce the Boeing 747, "jumbo jet" to the world with service from New York to London. Pan Am would add up to 50 of this aircraft to the fleet. A 747 in Pan Am's inaugural livery is shown landing on the right. In April of 1976 Pan Am was the first airline to introduce the Boeing 747SP (Special Performance) seen in flight on the left (click to enlarge). This smaller (by 47 feet) version of the 747 allowed Pan Am for many years to fly the longest non-stop flights in the world, including New York - Tokyo, New York- Dhahran , San Francisco - Hong Kong and Los Angeles - Sydney. In 1978 Pan Am proposed a merger with National Airlines to allow the company to quickly acquire domestic routes with the advent of airline deregulation in the United States. Two other airlines, Texas International and Eastern Airlines began a bidding war driving up the price of the transaction while the US Justice Department reviewed the merger proposal for anti-trust implications. There are many who feel that in the end Pan Am paid too much for National Airlines but just to have purchased National's fleet of aircraft Pan Am would have paid nearly the price of the merger at $400 million. 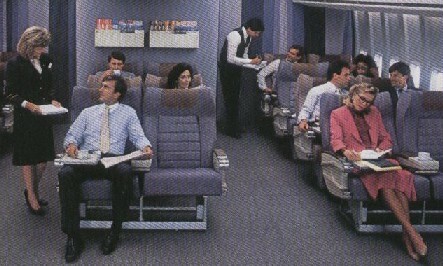 In 1979 Pan Am upgraded its 747SP fleet with sleeper seats in first class shown below on the left. Pan Am called these seats "Sleeperettes" a name that was first used on the Boeing 377 Stratocruisers in the 1950s. 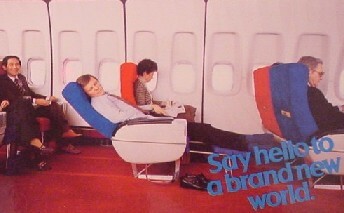 The new generation of Sleeperette seats were an immediate success and in 1980 Pan Am upgraded its entire long haul fleet with sleeperettes in first class. 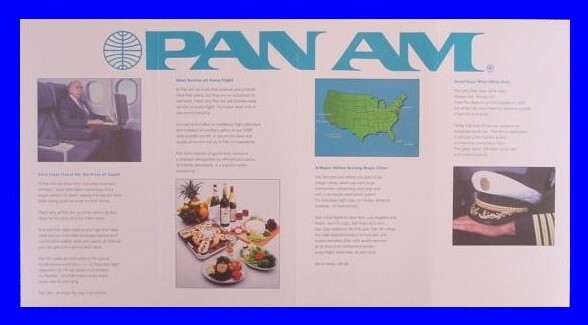 Also in 1980 Pan Am was the first US airline and one of the first international airlines to offer a dedicated business class section on long haul flights. 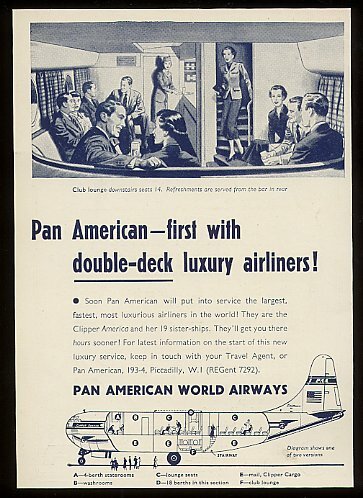 Pan Am called its business cabin "Clipper Class." A picture of Clipper Class circa 1987 is seen below on the right. In January of 1980 the Pan Am - National merger was approved and over the next three years Pan Am would merge National's fleet of DC-10s and Boeing 727s as well as National's operations and personnel into the Pan Am network. Also in 1980 Pan Am received the first of 12 Lockheed L1011-500s (seen on the right). This smaller version of the Lockheed Tri-star was put to use on long haul routes with less traffic than a 747 could support. Finally, in 1980 that Pan Am sold the Pan Am building for $400 million. In the summer of 1984 Pan Am signed an agreement with Airbus Industries to add A300s, A310s and A320s to the fleet. The A300s joined the fleet in the late fall of 1984 and the A310 began to arrive in the spring of 1986 making Pan Am the first US airline to fly the A310. An example of the A310-300 series can be seen on the left. The A320s never joined Pan Am. The production line slots were sold to Northwest Airlines. In 1985 in an effort to stem losses and reduce debt Pan Am agreed to sell its Pacific route network to United. United assumed the routes in February of 1986. To the right a former Pan Am 747SP with a United tail logo and Pan Am racing stripe, (click on image to enlarge). United absorbed the Pan Am routes overnight and it took several months for United to repaint the 747SPs & L1011s acquired with the route purchase. With the Pacific route sale Pan Am focused it's business on Europe, The Middle East, India, Pakistan, Africa, as well as Central & South America. In December of 1988 Pan Am flight 103 en route from London to New York was blown up by a terrorist bomb over Lockerbie, Scotland with the loss of all 270 souls aboard. The controversy that surrounded the circumstances of the bombing would scare away customers severely weakening Pan Am. To the right, flying in happier days, is N739PA the aircraft lost at Lockerbie, (click on image to enlarge). In the summer of 1990 just as Pan Am was rebounding from the Lockerbie bombing Iraq invaded Kuwait and many Americans canceled travel plans abroad. This hurt Pan Am greatly during the peak summer travel months. As America began to move troops to the Middle East in the fall of 1991 in preparation for Desert Storm potential customers continued to shy away from international travel. Pan Am was especially vulnerable as it had the least significant domestic network of all the major US airlines. Pan Am files for Chapter 11 bankruptcy protection in January of 1991 about three weeks before Operation Desert Storm commenced. In spite of its precarious financial situation Pan Am operated many troop charters prior to, during and after operation Desert Storm. The flights were operated with all volunteer crews and were staged from Pan Am's Frankfurt and Rome stations. To the right Clipper Ocean Spray, (N744PA), proudly wearing a yellow ribbon arrives home with a soldier displaying the American flag from the cockpit escape hatch. To pay off debt and remain in business Pan Am agreed to sell its North-east Shuttle and Atlantic routes to Delta Air Lines. Pan Am was to return to its roots flying between the US & Latin America. Part of the sale agreement required Delta to both fund and support (marketing & code-share) Pan Am's new Latin venture. When the agreement was signed in the summer of 1991 Pan Am's senior management departed and Delta appointed Russell Ray to Shepard Pan Am through the transition. Throughout the late summer & early Fall of 1991 all Pan Am initiatives had to be approved by Delta. There was a great deal of foot dragging on all requests sent to Atlanta. Delta took over the Pan Am Shuttle in September of 1991 and the Atlantic routes on November 1, 1991. Also on November 1st Pan Am II was launched. Pan Am II flew for a month with bases in New York & Miami. 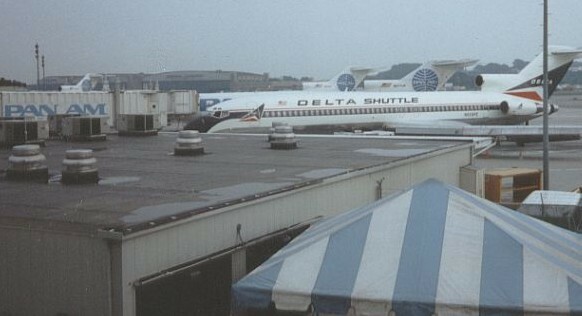 To the left the first Delta 727 pulls up to the Pan Am shuttle gates at New York LaGuardia the day before Delta took over the operation (click on image to enlarge). During the first few days of December meetings were held and Delta declared that Pan Am was "not making its numbers." Delta then decided to withdraw funding from Pan Am II and the company shut down on December 4, 1991. Though Delta was correct in the "letter of the law" there are many who believe that in the "spirit of the law" Delta failed greatly in its commitment to seeing Pan Am survive - especially as Delta had tied Pan Am's hands in the summer & fall of 1991 when Pan Am needed to be taking initiatives to ensure the reorganized company would thrive. Thus ended the life of one of the world's greatest airlines. 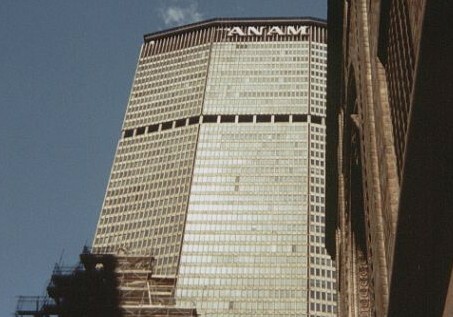 To the right the "P" is missing from the top of the Pan Am building as the company logo was removed from its former Manhattan headquarters in 1992. In early 1996 some financial investors retained former Pan Am President, Martin Shugrue, to re-launch Pan Am. 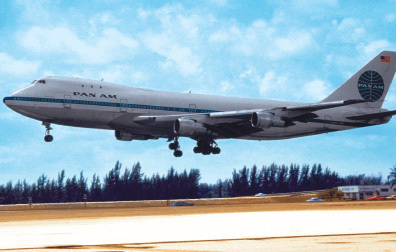 Based in Miami Pan Am II had hoped to launch service in May. However, due to changes in the certification process (that occurred during Pan Am's filing) the launch was postponed. The inaugural flights were New York - JFK to Miami & Los Angeles in September of 1996. 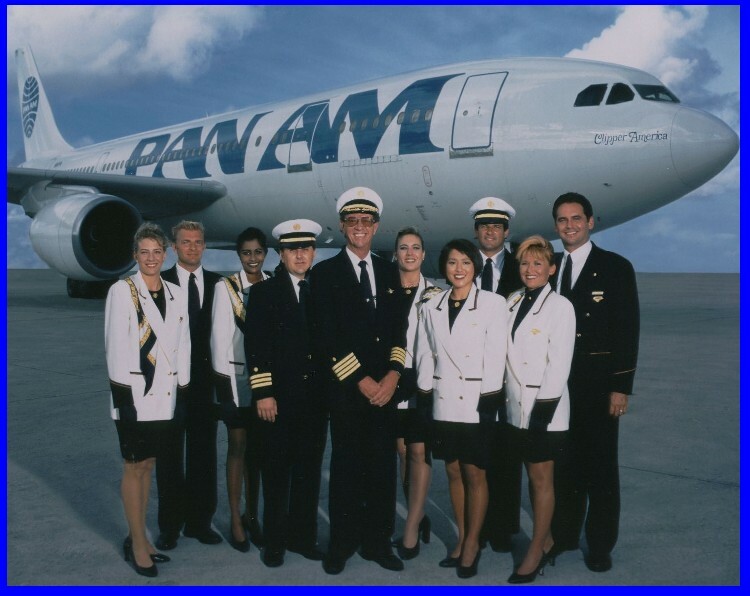 Below a crew from Pan Am II pose with an Airbus A300. The white uniform jackets worn by the ladies were reminiscent of the white serving jackets worn by flight stewards of the original Pan Am in the 1950s and 1960s. Pan Am II began with a fleet of three former Eastern Airlines Airbus A300s and grew to a fleet of five adding frequencies to Miami & Los Angeles as well as adding JFK-San Juan Service. To the left is a brochure promoting service from New York to Los Angeles. The fact that Pan Am had planned to launch service in May of 1996 and was delayed until September put the new company in a precarious financial state from the moment it took to the air as the company had full flight crews on payroll from May to September without any revenues being generated. Additionally, American Airlines & United Airlines very aggressively matched the new Pan Am's fares in markets where they competed. At the time Pan Am was the only operator of the A300 to Los Angeles and when there was a mechanical malfunction it was hard to get replacement parts. Several severe delays in the summer of 1997 tarnished the service reputation of the new airline. Meanwhile in Fort Lauderdale Carnival Air Lines a subsidiary of Carnival Cruise Lines was having problems of its own. The airline had been formed to fly customers to Carnival's casino in Nassau, Bahamas. Carnival Air Lines had grown out of its original mission and had flourished as a low cost carrier in the Northeast - Florida market. In the spring of 1996 a low cost carrier named Valuejet experienced a dramatic and highly publicized crash in the Florida everglades. For a time after this many people shied away from low cost carriers fearing that their maintenance practices were not up to industry standard. This was not true of Carnival but it still suffered from the perception. 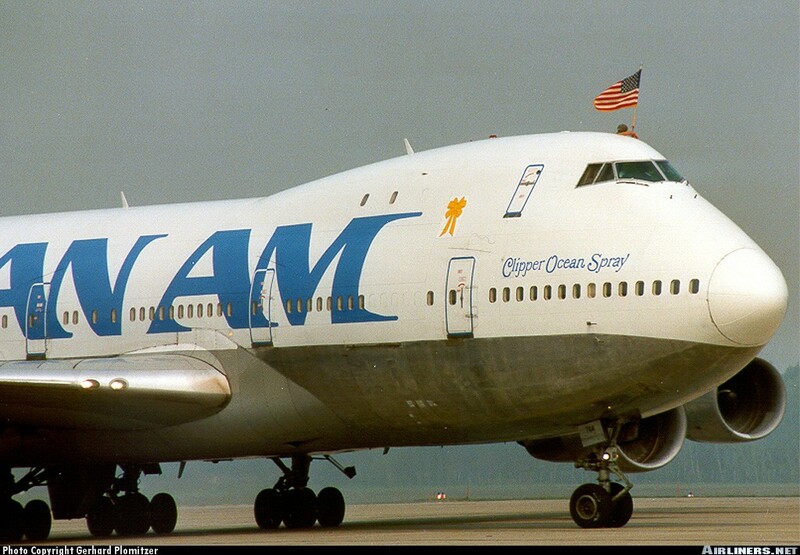 With losses mounting in the fall of 1997 Pan Am & Carnival Air Lines decided to merge. The Arison family, owners of Carnival, agreed to provide financing for the new company which would keep the Pan Am name. Along with the financing the Arison's wanted new leadership at merged company and Marty Shugrue was replaced by David Banmiller. Sadly, the combined companies were not viable and in February of 1998 Pan Am II ceased all operations and entered Chapter 11. Initially, there were several expressions of interest in the company. The bankruptcy judge was a great fan of the original airline and he wanted to see the Pan Am name flying proudly again. Eventually a deal was worked out and Guilford transportation acquired the Pan Am name & assets. Guilford moved the Pan Am offices from Florida to Portsmouth, New Hampshire and re-launched Pan Am (III) as a low-cost carrier with service from limited cities in the Northeast to Sanford airport in Orlando, Florida. Service to Florida was operated with a fleet of Boeing 727-200 aircraft configured with all economy seating. 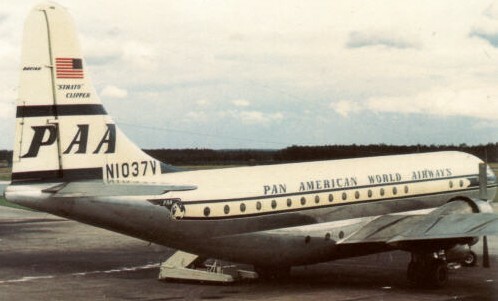 Pan Am tried several different strategies to grow their Florida operation and even offered service beyond Florida to Puerto Rico. In addition to limited scheduled service Pan Am III operated charter services. Guilford transportation created several subsidiaries including Boston-Maine airways and Clipper Connection which operated commuter flights. 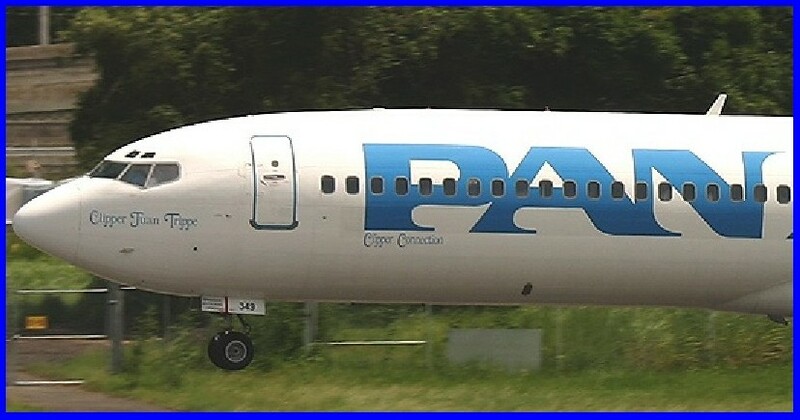 To reduce costs after September 11, 2001 Guilford transferred the fleet of 727s to subsidiary "Clipper Connection" and added "Clipper Connection" titles to the fleet under the "P" of the larger 'Pan Am' livery which can be seen in the photo below. As Guilford Transportation is primarily a train company it chose to rebrand some trains with the Pan Am livery. This was done before the airline operation was discontinued. 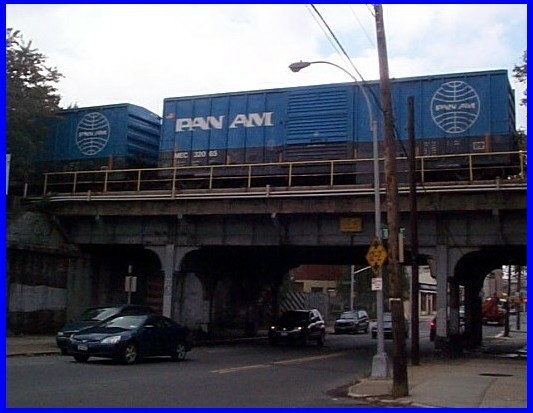 Pan Am Transportation rail cars can be seen around the Northeast of the United States. An example can be seen to the right crossing an overpass in New York City. 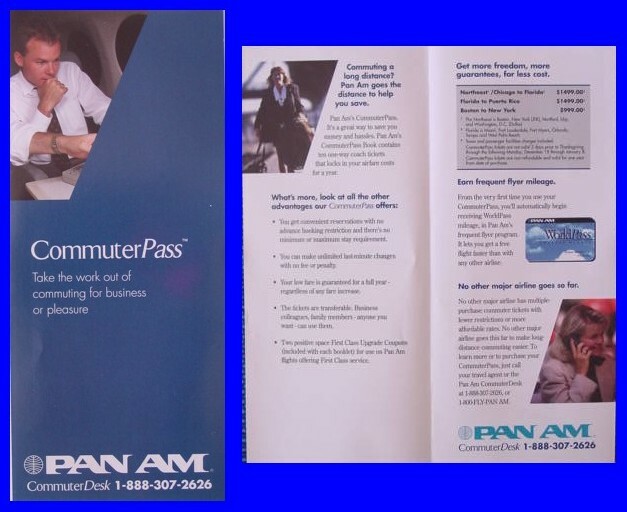 Though Guilford explored many ways to make Pan Am Clipper Connection viable rising fuel prices took a toll and the airline ceased operations at the end of February 2008. To my knowledge there are no current plans to revive or re-launch any airline operations. To reduce costs after September 11, 2001 Guilford transferred the fleet of 727s to subsidiary "Clipper Connection" and added "Clipper Connection" titles to the fleet under the "P" of the larger 'Pan Am' livery which can be seen in the photo to the left. Though the original Pan Am is now gone over ten years there is still a great deal of fondness for the airline from both employees and customers. This web site has many pieces of Pan Am memorabilia that can be seen by clicking on "The Collection" tab on the left column at the top of the page. Also, please book mark this site and check back as content will continue to be added. Should you have any questions about Pan Am or have some photos or other memorabilia to donate please contact me at: everythingpanam@aol.com Thank you for taking the time to visit everythingpanam.com. M. Kelly Cusack / creator & web master. Welcome to everythingPanAm.com the virtual Pan Am museum. 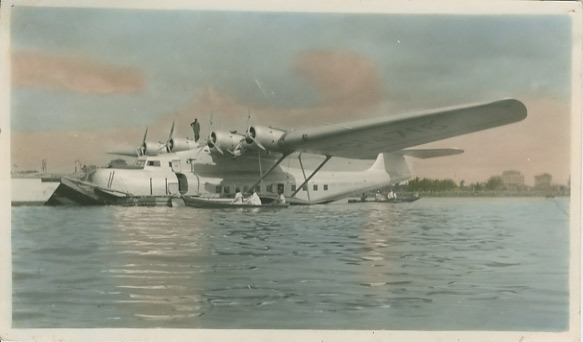 This site has been created to share some of the history & personality of Pan American World Airways through company issued publications artifacts and memorabilia. What follows below is a brief history of Pan Am from the personal perspective of the site creator, Kelly Cusack. For more on the history of Pan Am click the "Pan Am History" button on the left column above. PLEASE NOTE: AS A ONE MAN WEB SITE IT CAN TAKE TIME TO ANSWER THE MANY EMAILS RECEIVED. THANKS.